The death of Pope John Paul II has occasioned widespread discussions about his own stand and the Vatican’s position regarding a variety of subjects, from purely theological to social issues. Completely lacking has been any reference to an issue of concern to many, and especially to those interested in the subjects of UFO’s, Life on other planets, and Extraterrestrials in general, and in Zecharia Sitchin’s writings in particular. Yes, materially, Man could have been fashioned from a pre-existing sentient being. The high Vatican official was Monsignor Corrado Balducci, a Catholic theologian with impressive credentials: A member of the Curia of the Roman Catholic Church, a Prelate of the Congregation for the Evangelization of Peoples and the Propagation of the Faith, leading exorcist of the Archdiocese of Rome, a member of the Vatican’s Beatification Committee, an expert on Demonology and the author of several books. Appointed in the Vatican to deal with the issue of UFO’s and Extraterrestrials, he has made in recent years pronouncements indicating a tolerance of the subjects; but he has never before met and had a dialogue with a Hebrew scholar, and gone beyond prescribed formulations to include the touchy issue of the Creation of Man. The Hebrew scholar was me — Zecharia Sitchin: A researcher of ancient civilizations, a biblical archaeologist, a descendant of Abraham. I arrived there with my wife and a score of fans from the USA, on March 31st, scheduled to address the audience of over a thousand the next day. The Monsignor was nowhere in sight; but he was there the next morning to hear my presentation. “I drove the whole night from Rome to hear you,” he said. We are not alone — not just in the vast universe, but in our own solar system. There is one more planet in our solar system, orbiting beyond Pluto but nearing Earth periodically. Advanced “Extraterrestrials” — the Sumerians called them Anunnaki, the Bible Nefilim — started to visit our planet some 450,000 years ago. And, some 300,000 years ago, they engaged in genetic engineering to upgrade Earth’s hominids and fashion Homo sapiens, the Adam. In that, they acted as Emissaries for the Universal Creator — God. “We have much to talk about,” Msgr. Balducci said to me as he came forward to congratulate me on my presentation. “I have great esteem for your scholarship,” he said. ON LIFE ON OTHER PLANETS: “That life may exist on other planets is certainly possible… The Bible does not rule out that possibility. On the basis of scripture and on the basis of our knowledge of God’s omnipotence, His wisdom being limitless, we must affirm that life on other planets is possible. Moreover, this is not only possible, but also credible and even probable. ON INTELLIGENT EXTRATERRESTRIALS: “When I talk about Extraterrestrials, we must think of beings who are like us — more probably, beings more advanced than us, in that their nature is an association of a material part and a spiritual part, a body and a soul, although in different proportions than human beings on Earth. Angels are beings who are purely spiritual, devoid of bodies, while we are made up of spirit and matter but still at a low level. Well then, I asked Msgr. Balducci, does it mean that my presentation was no great revelation to you? We appear to agree, I said, that more advanced extraterrestrials can exist, and I use science to evidence their coming to Earth … I then quote the Sumerian texts that say that the Anunnaki (“Those who from heaven to Earth came”) genetically improved an existing being on Earth to create the being that the Bible calls Adam. Yes, I responded to the Vatican theologian, in my writings I deal with the physical evidence; but already in my first book (The 12th Planet), the very last sentence of the last paragraph raises the question: If the Extraterrestrials “created” us, who created them on their planet? From this my own thinking and the contents of my subsequent books evolved toward the spiritual or “divine” aspects. The Anunnaki, I have explained, were just emissaries (and that is what the Hebrew word Malachim, translated ‘Angels’, means). They thought that it was their decision to come here for selfish reasons and to fashion us because they needed workers; but in truth they only carried out the Almighty God’s wishes and plans. 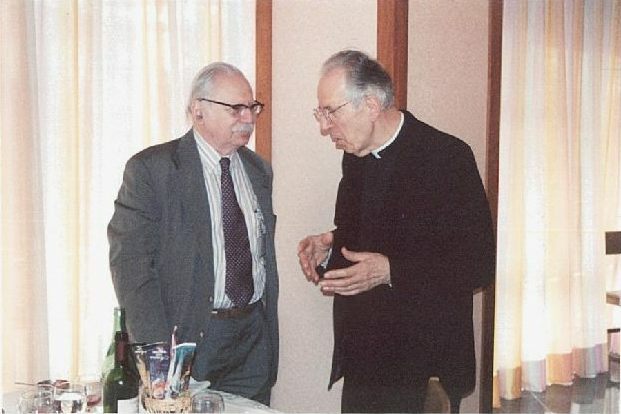 My second book, that deals with Man’s aspiration to ascend the heavens, is titled The Stairway to Heaven, I told Msgr, Balducci, “it seems to me that we are ascending the same stairway to heaven, though from different steps,” I said. This entry was posted in Writings and tagged Malachim/Angels, Monsignor Corrado Balducci, Professor Father Marakoff, Vatican on November 16, 2013 by ZSI.